2002 Winter League Champions. Jubilation all round with coach Tony Camilleri on extreme left. He is flanked by his assistant, Karl Izzo. We started the decade on a bright note when we made it another ‘first’, By winning the first winter league championship of the millennium! Indeed, all our players pulled their weight in this pre-season competition, including new recruits Kurt Dowling and Anthony Galea. The outlook was rosy in the summer competitions. However, there was disappointment in the final league match after we had been challenging for the title all season. The string of negative results extended to the Knock Out when we were beaten again by the Sirens. The year 2001 again ended on a barren note, this time the senior team also missing out on the winter league. Consolation came our way once again through the continued success, always under the guidance of Anthony Farrugia, of the three junior sides who carried off their respective championships for the second year running. The Ladies’ team, too, made it an en plein when they carried off the league title for the second consecutive year. The senior team had a taste of success through Niki Lanzon who won the Player of the Year title on the strength of his contribution to Neptunes and to the Maltese national team in 2001 and 2004, the first Neptunes player to win that title on more than one occasion. There was an exodus of a number of players at the end of the year. The club decided to make up for these by engaging some new talent in the form of Matthew Pisani, Charles Zammit, Keith Grima Scott and John Licari for 2002. Our expectations for the new season were uplifted when we won the first of four-in-a-row Winter League titles. That success boosted our ego for the summer competitions, which, however, was shattered when the expected success again failed to materialise. The year 2002 marked the end of the road for stalwart goalkeeper Adrian Cachia, who had rendered the club loyal and invaluable service for 20 years in the senior string. Former Neptunes favourite Tony Camilleri returned as coach, this time assisted by a new face, Karl Izzo. Again it was a matter of being so near and yet so far in 2003. We had started strongly in the championship race and were clear favourites to win the title, leading the table at one time by a clear margin of points. That kick-start was not maintained and Sliema were allowed to come from behind and clinch the top honours. Retribution came in the shape of the KO triumph. We beat Sliema 12-11 in an epic semi-final which extended to extra-time and that was followed by success over Marsascala in the final. 2003 Winter League Champions. Players, club medical adviser Dr Stefan Camilleri (standing, fourth from right) and assistant coach Karl Izzo (standing, extreme right) celebrate Neptunes’ success. Neptunes team makes merry after winning the 2003 Knock-Out competition. The slogan on the shirts “100% Maltin” refers to our rivals Sliema who included in their line up the Maltese/Australians Falzon brothers, Nicky and James. Former national coach Dirk Dowling was engaged as Neptunes’ coach in 2004, which again started with the team winning the Winter League honours. Summer was preceded by the Easter International Tournament organised by Neptunes as part of the 75th anniversary celebrations. Sicilian side Ortigia, who won the tournament, German team SG Neukolln Berlin and Sirens, besides hosts Neptunes, took part. The main competition in summer, reserved strong aspirations for our clan. These were brightly enhanced when we led the table until the final stages. In the process we won the President’s Cup at the expense of Sliema. Alas, the major prize eluded us for the umpteenth time when we came a cropper in the final match. To make matters worse we also lost against Sirens in the first KO commitment, thus ending our 75th anniversary year on a rather dismal note despite the strong start we made in 2004. A souvenir picture of the 2004 squad which won the President’s Cup by virtue of a 7-4 victory over Sliema. It was a replica of the disappointment we had when we celebrated the club’s 50th anniversary in 1979. Angela Galea who was honoured as Malta’s Sportswoman of the Year for 2004, swam for Malta at the Sydney 2000 and Athens 2004 Olympic Games, the Manchester 2002 Commonwealth Games, and the 2003 World Swimming Championships in Barcelona. Neil Agius also swam for Malta in Athens. Tuesday the 31st day of May 2005, is a red-letter day for the Maltese Swimming Association and, particularly, for our swimmer Angela Galea, as on that date she became the first Maltese to win a gold medal in Swimming in the Games of the Small States of Europe. Competing in the 200 metres butterfly stroke race in the Serradells Swimming Pool in Andorra, the Neptunes swimmer won gold clocking 2.21,79 for the event, beating her great rival, Simona Mucciola of San Marino, by 0.96 of a second, to give Malta our first-ever golden success in the discipline. The years 2005, 2006 and 2007 can be termed as successful for the club. A long connection with our club spanning over 30 years, reached its pinnacle for Matthew Bonello. Towards the end of 2005, months of procedural wrangling and general meetings followed by two rounds of voting to elect a new committee resulted in a facelift at administrative levels, including a change in the club’s presidency. Matthew succeeded Joe Psaila, whose 13-year term at the helm of the club started in 1990, only to be interrupted between 1994 and 1997 by Austin Sammut. 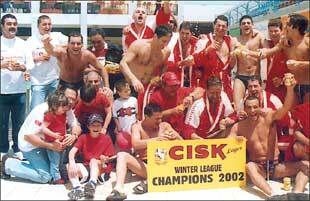 In 2005 Neptunes shattered Sliema’s dream as they capped the season in a flourish beating the Blues 12-11 and pipping them for second place, at the same time ousting them from a play-off against Sirens for what could have been an unprecedented fifth championship title in successive years for Sliema. It must here be pointed out again that between 1933 and 1945, the league championship was contested for on seven occasions and Neptunes won the title on the five consecutive times they took part (1933, 1934, 1937, 1938 and 1945). In 1935 and 1939 Neptunes did not take part in the competition and Sliema United took advantage of our absence to win both titles. 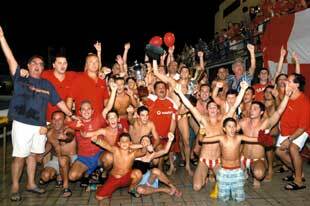 The 2005 Knock-Out winners in jubilation after their 10-9 success over Sliema. Despite Sirens’ failure to beat the Blues in 2005, their better consistency helped them get the better of Marsascala on three occasions and twice against Neptunes. The Reds of Balluta had the platonic satisfaction of being the only team to record a league victory over all their opponents, while the south seasiders lived up to their billing of being Sliema’s banana skins, as the Blues were never able to lower their colours in the title race. The Knock-Out competition, reaching its 60th landmark since Neptunes won it for the first time in 1934 under the name of ‘ASA Cup’, left us with the sweet taste of success when we beat Sliema 10-9 in the final. That match will surely linger in Michele Stellini’s memory after he scored a splendid naphand to help his team to victory. Tradition again surfaced in that pulsating duel as Neptunes added another name to their list of ‘firsts’ – the Wilkinson Sword Cup – to make it a total of nine honours between League and Cup bearing the name” of new sponsors. That triumph also meant that Sergio Afric at last managed to win a major prize with every team he coached, having had successful spells with San Giljan, Sirens and Sliema. Assisted by, Karl Izzo, the Croat finally brought out Neptunes’ full potential. Before leaving the island, Afric highlighted the character and recuperative skills of his team. “I always believed that once Neptunes showed character in their play they had the talent to beat all their opposition. That quality came out in the last two matches against Sliema, when they twice recovered from two-goal deficits in the final session. Their speed and physical condition also stood out”, Afric said. Players from overseas were set to grace our national pool once again and in 2006 our choice fell on veteran Croat Dubravko Simenc and this was vindicated as we clinched our first championship crown in 12 years! Our team was finely balanced and we pipped our nearest rivals Sliema, who had Hungarian prodigy Tibor Benedek in their ranks, with points to spare. The championship crown was back at Balluta Bay. Efforts to strengthen the team and try to retain the championship in 2007 were made immediately after the 2006 season ended. Serbian idol Vlado Vujasinovic was snapped up from top Italian side Pro Recco and Sergio Afric’s immediate reaction to the club president was “Abbiamo appena vinto il prossimo campionato!” And how true that was. Vlado turned out to be the toast of the game’s connoisseurs as he managed to bring the best out of his colleagues with his superb marshalling at the back, closing all gaps and his play-making was the platform of our offensive stints. The final game that wrapped up the championship for us will go down in the club’s history as the biggest win Neptunes ever registered over Sliema – 12-4. The year 2008 brought long faces back again and it was an anti-climax following the two excellent years that the club had just experienced. The club was not happy with the foreign recruits and with hindsight we feel we were let down by the performance of our coach Afric. In fact a few days after the season ended Afric joined Sliema, the club he had vowed never to join again! Difficult to understand. Our club had to make do without the full services of captain Niki Lanzon who missed some of the opening matches and Steve Camilleri who injured a finger and was sidelined for most of the season. Steve Camilleri brought back a cheer on the faces of his ardent Neptunes followers and to those who have the Maltese sport at heart when he turned outstanding performances for his top Italian Serie A waterpolo side RN Bogliasco for whom he is scoring prolifically. In fact Steven finished as Bogliasco’s top scorer for two successive seasons 2009/2010 and 2010/2011 at the same time ending in the topmost bracket of the Italian Serie A1 scorers, most of whom are world renowned. But a great honour which befell Steven due to his honest endeavour was when he was chosen to form part of the All-Stars team in a benefit match in early 2010 and also scored in that match. He was even top-scorer for Neptunes in 2010 pipping all the outstanding overseas players by a handsome margin. The year 2009 again did not offer much for the club and the only honours that came our way were the ‘usual’ junior success, this time in the form of the Under-16 championship and the landing of the President’s Cup, played in the second part of May 2009. Neptunes beat Sliema 10-5 when no overseas players were used. That year we had engaged former Italy waterpolo coach Paolo Mallara and in the playing ranks Aliosa Kunac (a Croat who joined Sliema in 2010), and Leonardo Sottani, a former Italian international.